This is the story of my Lourdes Pilgrimage - a brief, yet memorable trip we made after World Youth Day 1997 in Paris. It has often been said that, for Catholics, there are three major pilgrimage sites: the Holy Land, Rome, and Lourdes. The first site is in the Middle East; the other two, in Europe. It would have been a great opportunity lost if we did not take advantage of our World Youth Day-Paris 1997 trip to visit Our Lady in her miraculous grotto in Lourdes, France. Our trip to Lourdes was by bullet train on the morning of August 26, with return to Paris via “sleeping train” at 10 in the evening of the same day. The 5-hour ride gave us a wonderful view of France’s beautiful countryside. In Lourdes, the weather that greeted us was very cool, a wonderful change from the summer heat in Paris. The Pyranees Mountains that border France and Spain provided a wonderful backdrop to the historic town of Lourdes. Lourdes itself is quite small; one can take a leisurely stroll through the whole place. A very commercial Lourdes will first greet the traveler for hundreds of shops and inns line the streets. Because stores close at 8 in the evening, we had to shop first for flowers, souvenirs and plastic bottles for Holy Water. After those minor, necessary interruptions, we proceeded with our little Lourdes pilgrimage. 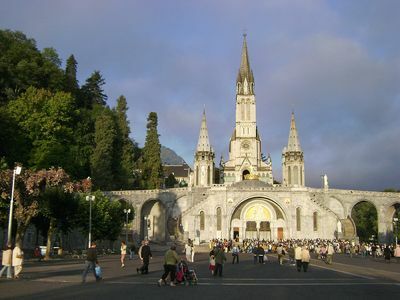 The gate to the Lourdes pilgrimage area gives one a holistic view of the Calvary, the Crowned Virgin, and the basilica. 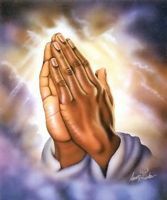 Along the way, one will see many statues of Bernadette praying, tending her sheep, and talking to Our Lady. Some portions of the fence that lines this esplanade is covered with flowers offered by devotees to St. Bernadette. The round, fenced-in garden of the Crowned Virgin is adorned with even more flowers. People in their wheelchairs stop by to pray or leave flowers; some more able-bodied pilgrims even stoop to kiss the ground. There is a prevailing feeling of peace and despite it being “pilgrim season,” there is still a modicum of respectful silence. We were, after all, treading on holy ground. Our first stop was the “3-layer-church,” which I so dubbed because the one massive magnificent structure actually houses two basilicas and a crypt. The lowest “tier” houses the Basilica of the Holy Rosary, so named because of the mosaics depicting the mysteries of the rosary. From there, a steep flight of steps leads one to the Crypt, blessed on the day of Pentecost 1866. A breathtaking view of Lourdes and the Pyranees greets pilgrims further up, at the (Upper) Basilica of the Immaculate Conception. Built in 1871, this church is built on the rock of Massabielle, and the sanctuary is directly over the place of the apparitions. In all three basilicas, one will note the thousands of marble tiles on which are inscribed words of gratitude in different languages. If one will allow his scientific mind to think for a while of logistics, one will marvel at the number of tiles of gratitude lining all the walls of all three churches. These are testimonies from hundreds of thousands of devotees who embarked on their own little Lourdes pilgrimage just like us - and who placed their lives in the care of Our Lady and were not disappointed. At the holy grotto, one will find himself at a loss for words for here – here! 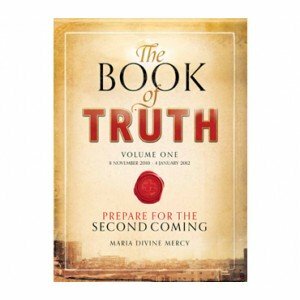 – is where Mama Mary appeared to Bernadette 139 years ago. On the ground, covered by glass and illuminated by little spotlights, is a hole marking the spot where Bernadette stood, and through which one can see running water. Above the hole, hanging on a wire, are crutches; towards a recess in the grotto are sickbeds. All these have been left behind by the ill and disabled people who no longer have any use for them. As we went along following the line, we saw her – the image of Our Lady of the Immaculate Conception – and everything got blurry from that point onward for we had all begun to cry. We kiss the grotto wall and touch as much of it as we can. We can do no more until our turn has passed and we give way to the others – both able and disabled – who, like us, have come from afar to see Our Lady. This was indeed the climax of our little Lourdes pilgrimage. After the procession, we went off to the side near the grotto to get holy water. While it was tempting to collect as much water as we could possibly carry from the many faucets lining the wall, we had to think of the others waiting for their turn. As long as the lines were, there was still no pushing or scrambling to get to a faucet. We simply trusted that there would be enough water for everyone. When our containers were filled, we went back to the grotto to say goodbye. This time, it was zero visibility… We had forty precious minutes left in our Lourdes pilgrimage, and that included the 10-minute brisk walk needed to get us to the train station. Our farewells probably got all mixed up in our heads; our thanks, I hope, were a bit more coherent. 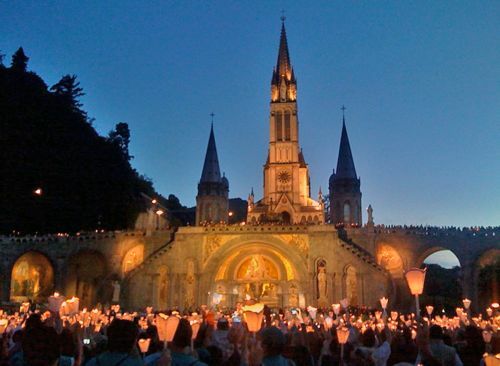 We promised to return and stay even longer next time in our next Lourdes pilgrimage – to join in the Via Crucis, visit the baths, reflect in the Adoration Chapel, hear Mass, read about Bernadette in the library, visit her home… Everything! We then promised to “take our readers to Lourdes” by sharing with them our Lourdes pilgrimage experience for, indeed, to whom much has been given, much is expected. So thank you, dear reader. Thank you, Dear Lady! Click here to return from Lourdes Pilgrimage to Inspirational Stories.